After my husband Eric and I got married in September of 2014, I wanted to take a honeymoon but was not excited about planning it. We decided to delay our post-nuptial adventure, but to at least start thinking about where to go. 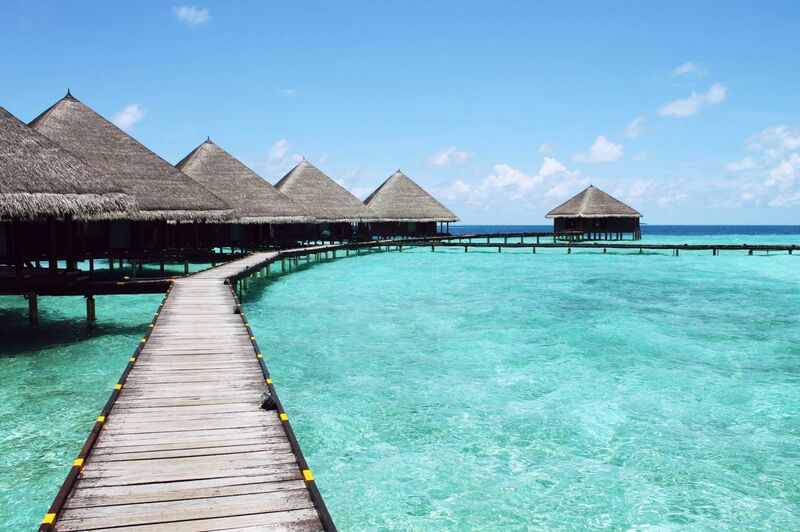 Originally, I’d wanted to go to Bora Bora, imagining we could stay in a hut perched on stilts over crystal blue water. Well-traveled friends told us that we’d be bored in Bora Bora and that we should consider somewhere we could be more active, like New Zealand. When Eric — who loves to travel so much he was promoting the idea of a staycation honeymoon — got on board with the idea, so did I. But then three months went by, during which I only passively scanned air fares and bought a Lonely Planet guide. We’d settled on a destination but it wasn’t clear we’d ever get there. On New Year’s Day, 2015, looking out at the whole year ahead of us, we pulled the trigger on a flight from San Francisco to Auckland, leaving auspiciously enough, on Valentine’s Day, and returning two weeks later. I’d read that February was an ideal time to go, since it was late summer in the Southern Hemisphere and also after most Kiwis had returned home from their own holiday travels. The timing also worked well with our schedule since Eric and I were training for a 50K trail run taking place the weekend after we returned. We reasoned that we could get the bulk of our training in before the trip. It might seem silly but this was not an unusual consideration for us (hence the suggestion we go somewhere more active). Since we started dating four years ago, many of our trips together have involved races or training. But this trip was going to be different. Because while I knew we’d be getting plenty of exercise, the real purpose was to spend time together and explore a new place. The next challenge was figuring out where to spend our 14 days. Fortunately we had access to plenty of opinions — in case you haven’t noticed, New Zealand has become the “it” place to travel — so I crowdsourced ideas from where else? Facebook. Next I made a list of the places I most wanted to go and things I wanted to do, based on the suggestions of others and my own interests (wine, hiking, scenery). At this stage, it was pretty obvious that my homebody husband was abdicating any planning responsibilities so I felt free to shape the trip I wanted to take, but one I knew he’d enjoy too. At the top of my list, unequivocally, was one of the Great Walks, ideally the Milford or Routeburn Tracks. From everything I’d heard and read, these were reason enough to travel to New Zealand. I researched the fancy option, where they feed you and put you up in luxury accommodations, but these excursions were all booked and also lasted several days, which would have cut into the rest of our time. And besides, we were more DIY when it came to this kind of thing anyway. So I looked into the DOC (Department of Conservation) huts, and snagged the only night available during our trip at the Lake Mackenzie Hut on the Routeburn Track. With that set, I began to piece the rest of the itinerary together, beginning in Marlborough, the heart of New Zealand wine country, and ending in Otago, the birthplace of bungee jumping. The trip was not exactly relaxing — we spent the night in nine different places and only ever stayed two consecutive nights in one spot — but if I’d wanted relaxing, I would have gone to Bora Bora. 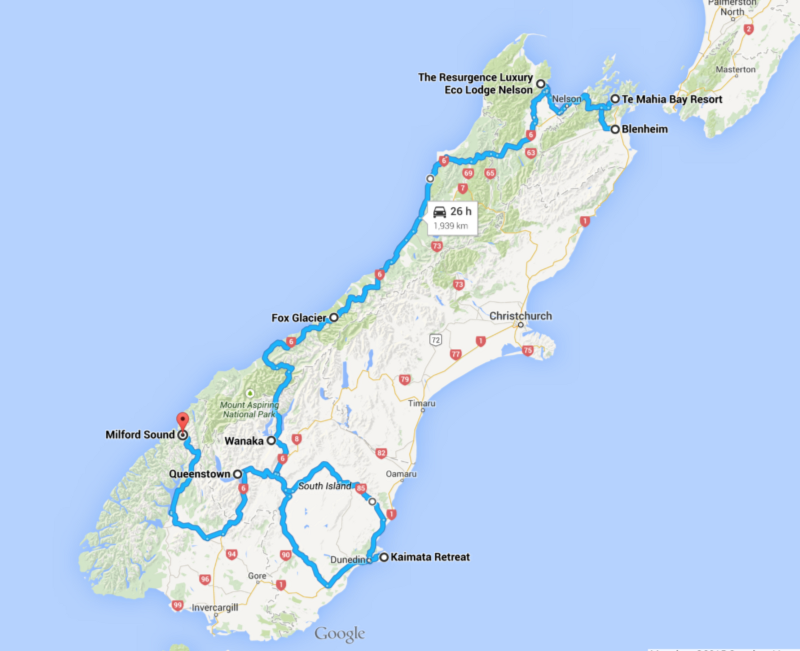 Here’s our South Island road trip, with recommendations for where to stay and eat, and what to see and do. It’s written so you can read the whole thing in one go, or just scan for the places you plan on visiting. You can also just look at the photos, and if that doesn’t convince you to put the South Island on your five-star list, then I don’t know what will. Plus, check out all of my TripAdvisor reviews for a more detailed take on our accommodations and excursions with additional photos. Finally, I highly recommend going in February. Although it’s high season, the weather was nearly perfect and a great escape if you live in the Northern Hemisphere. However, if you do go during this time, I suggest booking as much as possible in advance. Our route from north to south. Tranquil Te Mahia Bay in the Kenepuru Sound. I don’t know much about wine, but the first variety I developed a taste for was Sauvignon Blanc from New Zealand’s Marlborough region. So despite the fact that my home is near an epicenter of winemaking (Napa and Sonoma), I decided that the Marlborough Valley’s wineries merited a visit. After Eric and I landed in Auckland, we hopped a one-hour flight south to Blenheim (with a great view of the Mount Taranaki volcano on the way). After landing at the tiny regional airport around noon, we picked up our rental car — a Mazda Demio I nicknamed “The Little Red Hen” — and then remembered that we would be driving on the left side of the road. We set out to visit a few “cellar doors”, the Kiwi term for tasting room, heeding the Lonely Planet’s recommendations, along with my instincts. The driving took some getting used to and my directions to Eric mostly consisted of yelling “Turn right here now!” This led us to three very cool, very different wineries — Forrest, Cloudy Bay, and St. Clair — where we picked up six bottles to sustain us for the rest of our trip. We sampled the menu at Cloudy Bay and also indulged in a Devonshire tea at Pataka, near St. Clair’s cellar door. 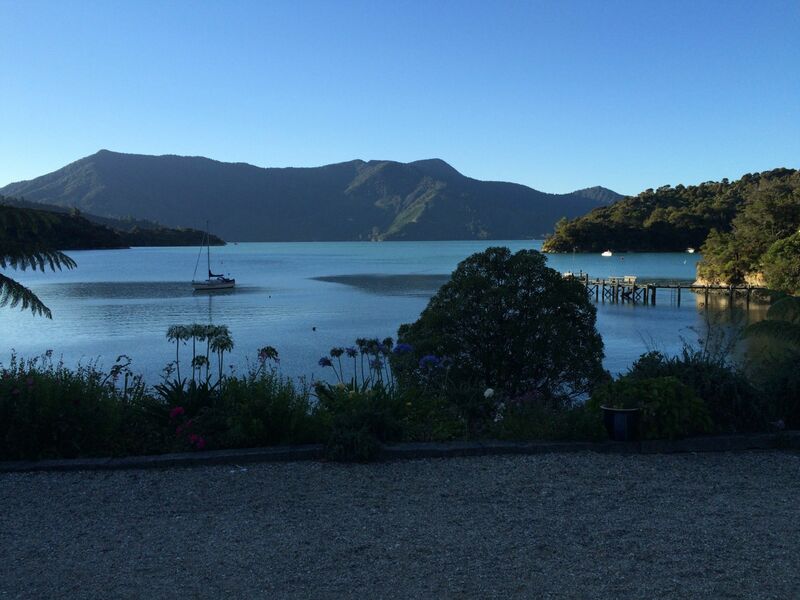 Blenheim and the rest of the Marlborough Valley were gorgeously bucolic, but we were bound north to spend our first two nights at the Te Mahia Bay Resort on the Kenepuru Sound, a 1 hour, 20-minute drive away. It was a perfect way to start the trip, winding along the dazzling Queen Charlotte Drive in early evening, after a lovely summer day. My only regret is that we didn’t pull over to savor the views, but we were still getting used to driving on the left side of the road and it seemed better not to overcomplicate things. As we turned off the main road, I was struck by how isolated and remote it felt. Since passing the hamlet of Picton miles before, there were few real towns or businesses out this way. We were taken with the grand scale of the landscape, and with the foliage, a mix of pines and huge ferns. We’d never seen anything like it before. We spotted the sign for Te Mahia, and turned down the road to the peaceful hideaway. We spent the next day running and hiking a steep and scenic section of the Queen Charlotte Track, to a deafening chorus of insects. We’d planned to catch a water taxi to another resort for dinner, but since I was suffering from a bit of heat stroke and dehydration, we spent the rest of the evening — it stayed light until 9 pm — just relaxing and gazing out at the bay. For dinner, we picked up a frozen meal from the Te Mahia shop, which a chef prepares and delivers to the resort every few days. Kayaking into Mosquito Bay on the Abel Tasman Sea. After a day and half on the Sound we were ready for our next adventure and pointed our Little Red Hen west for the 3-hour drive. Our first stop was the Pelorus Bridge where we gazed down at the emerald gorge and learned about the plight of New Zealand’s only native land mammals — two species of bats whose survival is threatened by introduced species. Next we passed through the foodie town of Nelson before stopping for lunch in Mapua, at a lovely cafe called The Apple Shed, overlooking the Waimea River. From there, we headed to Riwaka (pulling over to pick up a few beers from local brewery Hop Federation) where we were set to stay for two nights at the Resurgence Lodge. After driving into a small valley filled with tiny farms, we turned up a steep drive and found the lodge tucked into the side of hill, looking out across a lush valley. Our room — they call it a bush chalet — felt like a luxurious treehouse. We met a mix of American and British tourists over champagne and appetizers on the veranda at the main house, then enjoyed a delicious home-cooked dinner served family style (corn fritters, zucchini soup, snapper with couscous). 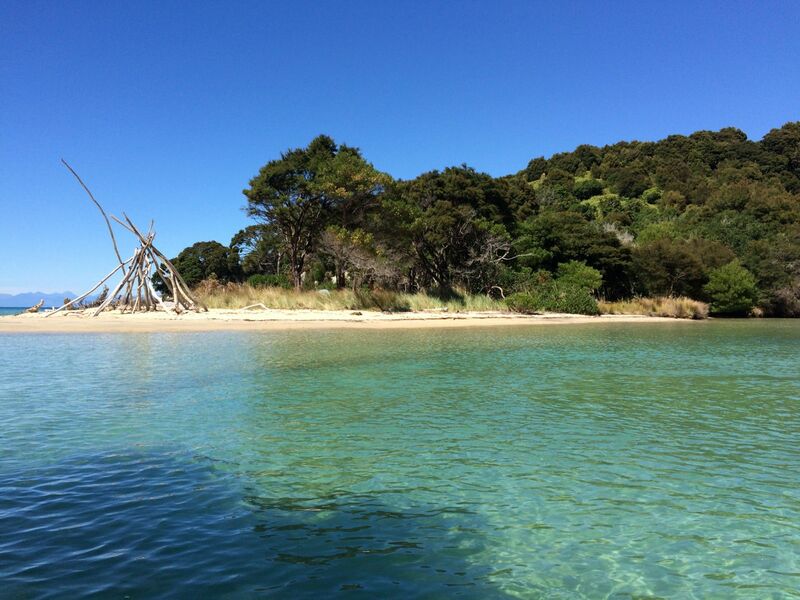 We could have spent the whole next day just relaxing and listening to the birds at the Resurgence, but we were out the door early to Marahau, to catch our kayaking tour with The Sea Kayak Company in Abel Tasman Park, one of the most memorable days of the trip. After our water taxi took us north into the marine reserve, we paddled our kayak out to Tonga Island where we saw baby fur seals learning to swim in the tide pools, tiny blue penguins, and cormorants. My favorite part of the day was gliding through the lagoons in Mosquito Bay (which is pictured above, and not plagued by mosquitos as the name suggests). We marveled at how crystal clear the turquoise blue water was — something we noticed throughout our time on the South Island. We had lunch on a sandbar at Bark Bay with our group (there were eight people including us and a guide), then split off for a two-hour hike along a mellow trail to Torrent Bay, where low tide had left an expanse of sand for us to traverse. Having arrived at our water taxi pick-up spot an hour early, we decided to make a quick detour, running the trail to Cleopatra’s Pool, where I wish we’d had more time to splash in the river and falls. We’re still talking about the burgers we ate that evening in Marahau at Fat Tui Burger, a food truck that’s anchored in place. We left satisfied, donuts and fried pineapple rings in hand, and enjoyed a glass of Riesling in the hot tub back at the lodge. Before departing the next morning, we visited the source of the Riwaka River, which gives the lodge its name. Watching the crystal clear water emerge from the underground caves, it’s easy to see why the Resurgence is a sacred place for the Maori. 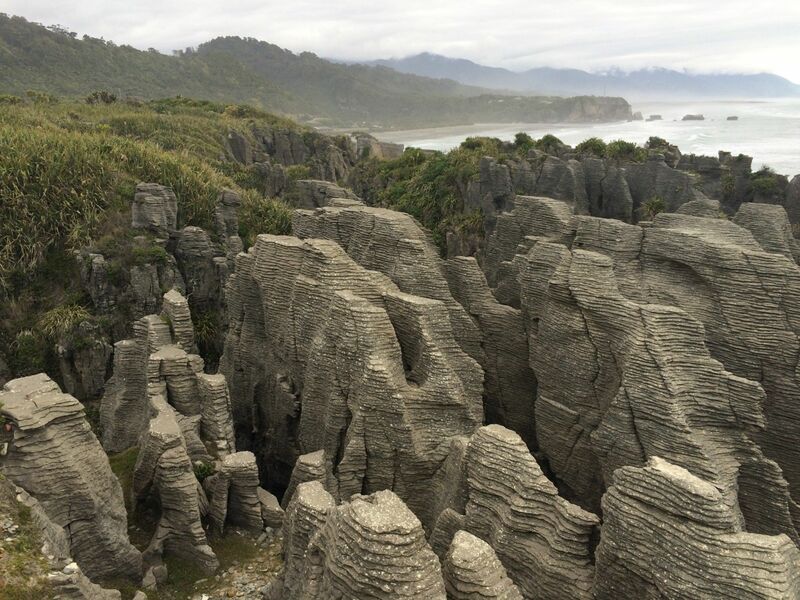 Checking out the Punakaiki Pancake Rocks on the West Coast. Leaving Riwaka, we passed through hop fields and orchards as we cut over to the West Coast. This was our longest day of driving — 6 hours, 30 minutes — broken up by stops in Westport & Cape Foulwind, the Punakaiki Pancake Rocks, and then dinner in Hokitika at Fat Pipi Pizza, which hit the spot, though we weren’t adventurous enough to try the whitebait pie. After we ate, we ventured out to the beach to find that the town was in the midst of its annual driftwood sculpture competition. The coastline on the drive reminded us a lot of Northern California (where we’re from), so while it was beautiful, we were glad we hadn’t planned to spend much time here. The day was mostly uneventful until late at night when, somewhere outside the tiny town of Hari Hari, still 52 miles from our destination, Eric noticed that our empty gas tank light was on. After a good samaritan at a roadside hostel gave us the little fuel he had, we coasted into the village of Whataroa and called the gas station owner, who generously got out of bed to come fill up our tank. We made it to Fox Glacier that night after all, but not without panicked visions of sleeping in the car on the side of the road. Feeling like a tiny speck while exploring Fox Glacier. 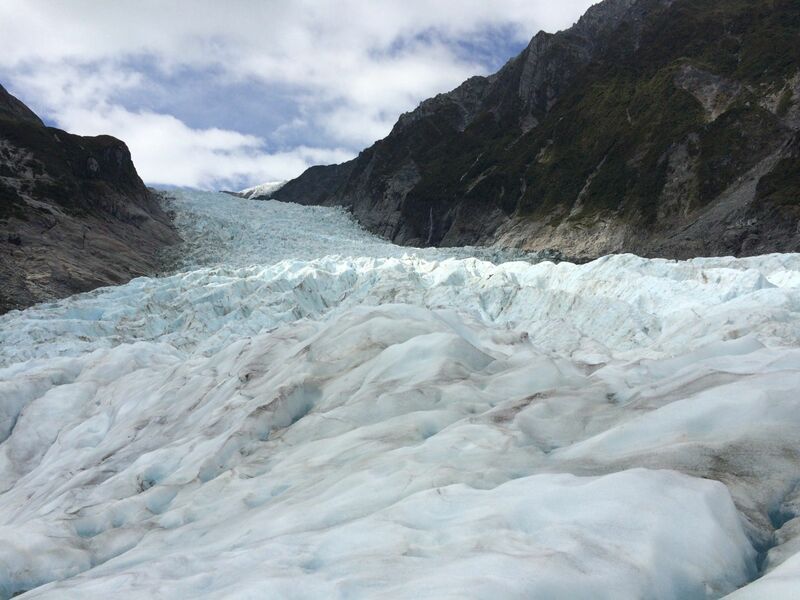 I had considered skipping the long drive from the north end of the island to the south and just hopping on a flight instead, but that would have meant missing a visit to one of New Zealand’s glaciers. And since, thanks to climate change, there’s a chance they might not be around forever, I decided the opportunity was not to be missed. Upon waking that morning — to the sounds of helicopters — and seeing the town in the daylight, I realized it felt more like the tropics than the Alpine village I had been expecting. Eric and I packed up our things and popped them into the car before walking across the road for our 10 am ride up to the glacier. We’d stayed only one night at Fox Glacier Lodge because that was all they could accommodate us for. The lodge had a homey, chalet feel that reminded me of a friend’s Tahoe cabin. The price was right and the location at the center of the tiny town couldn’t have been better. Fox Glacier Guides was hopping that morning, and after checking in we were apprised of the various permutations of refunds we would receive if, due to the weather, we had to come back down from the glacier before our tour was scheduled to end. We crossed our fingers and were thankful we’d opted for a morning tour since fog and rain were apparently more likely in the afternoon. After a quick van ride out to the landing pad, we climbed aboard the helicopter with the other members of our group (there were ten of us) and were whisked up to the glacier in less than five minutes. We tied on our crampons and followed our guide Kat across the ice, learning about the glacier’s history of expansion and retreat, observing various features, and taking lots of photos. Standing on the gigantic field of ice, I felt smaller than I have ever felt. It was hard to comprehend that it was slowly moving beneath my feet at that very moment. Back on dry land (or simply, land), we checked into the Sunset Motel, on the outskirts of Fox Glacier. It’s a better than average motel, with stunning views of the glacier, but a bit pricier than the Fox Glacier Lodge. I’d say either is a good option, depending on whether you prefer convenience or a view. The motel also is on the road to Lake Matheson, a pond set in a beautiful natural park a few miles from town, and the perfect destination for a short run. Eric and I made the out and back trip, and shortly after our return, it began to rain. We showered and headed into town for a lovely meal at The Last Kitchen (kumara chips, salmon risotto), where we ran into our glacier guide Kat who had recommended the restaurant earlier that day. Lake Wanaka, as seen from the shore in town, with the trail to Glendhu Bay along the left. From Fox Glacier, we headed south, continuing along the coast to Haast, where we stopped at Knights Point to take in the view. We then followed the road east and inland, along the edge of Mount Aspiring National Park, and then south again along the shore of Lake Wanaka. I could feel myself beginning to take the scenery for granted — the views were stunning at every turn. When we arrived in Wanaka after 3 hours on the road, I remembered why it had been so hard to find a place to stay: an Ironman-distance triathlon was underway in town. Still, we had ended up securing a privately owned apartment, which was new, nicely decorated and in a cute residential neighborhood just a short walk from Lake Wanaka. This was the day of our trip that Eric and I had set aside to do our final long run before our upcoming 50K. So, despite the afternoon heat (temps in high 80s) we filled up our water bottles and set out on a trail along the water’s edge toward Glendhu Bay, in the opposite direction from the race. We went out 7.5 miles, snapped a photo and turned back. That night we headed to the lively downtown for one of the best meals of our trip, at Francesca’s (polenta fries, pasta with peas, arugula and basil) and afterward joined the party at the race finish to cheer the last of the triathletes across the line, including a couple who had gotten married on the course earlier that day. 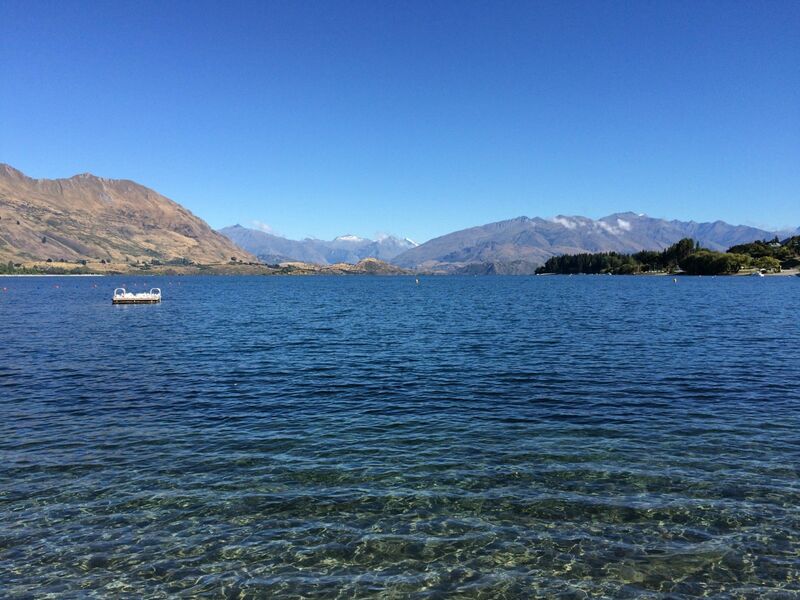 We felt very at home in Wanaka and were sad knowing that we would be leaving the following morning. The view from our room at the Kaimata Retreat. Even though it was hard to leave each place we went, there was also the anticipation of our next destination. And we were heading into the part of the trip I’d been dreaming about. We drove the Little Red Hen along the scenic Crown Range Road south into Central Otago, with a stop for photos in Cadrona, before cutting east, with a photo stop in the gold rush town of Ophir. The scenery was less dramatic than what we’d seen in days prior, and reminded me more of California’s Sierra Foothills, with its rolling hills and wide-open spaces. After 4 hours of driving, we arrived in the city of Dunedin from the north. Apart from our brief drive through Nelson, this was the first real city we’d encountered and my culture-loving husband was excited to check out the art museums and the New Zealand Sports Hall of Fame, located at the gorgeous Renaissance Revival-style railway station. On the lookout for our next meal, we took Lonely Planet’s recommendation to dine at Plato, south of downtown near the wharf. We lucked into an early dinner reservation and were not disappointed — the food was inventive and flavorful (green lipped mussels with chorizo, elephant fish in curry) while the decor was funky and eclectic. The owner convinced us to take a slice of cheesecake with us and it was perfectly light and lemony. As the sun slipped below a bank of heavy fog, we left the city, bound for the nearby Otago Peninsula. The road ran treacherously along the water’s edge before turning to gravel inland. As signs of life — and actual road signs — grew sparse, we were grateful we still had access to the map on our phone to show us the way. We pulled into the driveway of the Kaimata Retreat and received a cheerful welcome from the owner, Kyle, and the retreat’s other guests, before settling into our cozy, boho-chic room. 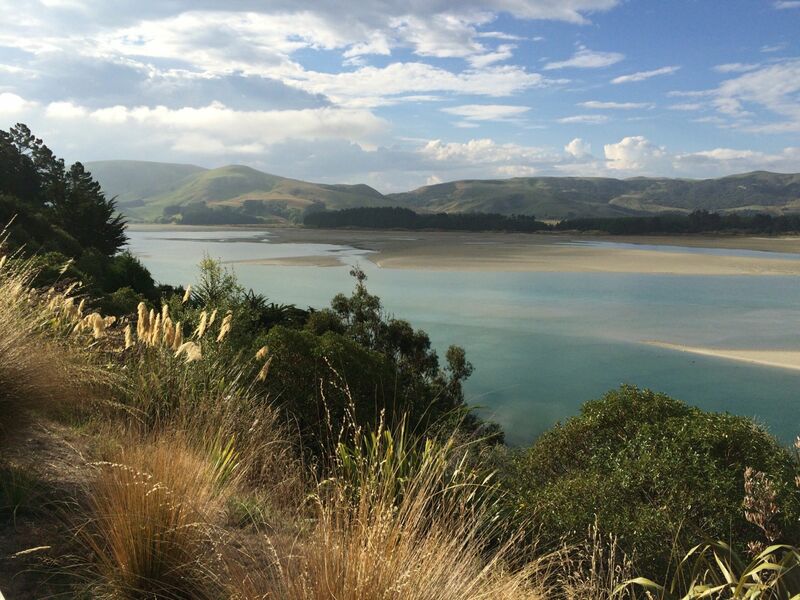 The next morning, I was excited to wake up and see an expansive view of the estuary, glittering in the sun. After a hearty breakfast, Kyle offered to ferry us in his boat to nearby Victory Beach, which we had all to ourselves, save for the other couple staying at the retreat. We took in the wildlife and scenery before meeting up with Kyle for the return trip. That afternoon I took a paddleboard out into the estuary, doing my best to follow the tides. Then we helped the retreat’s chef, Claire, dig clams for our dinner, which was our favorite of the trip (we knew it was local and fresh). When we had to tear ourselves away the next day, I was already scheming when and how we could return to this haven for a week or two. The trail ahead: The top of Routeburn Falls looking into Routeburn Valley toward Harris Saddle. Leaving the Kaimata Retreat wasn’t easy, but we had a date in Queenstown that we couldn’t miss and a 4-hour drive ahead. We needed to pick up our tickets for our stay at Lake Mackenzie Hut before the DOC visitor center closed at 5pm, since we were catching a bus to the Routeburn Track trailhead the following morning at 8 am. We headed back west via the southern route, with a stop in Roxburgh for some Jimmy’s Pies. Arriving in Queenstown, Eric dropped me with our bags at the posh Queenstown Park Hotel at the edge of downtown. I hoofed it into town to pick up the hut tickets, while he said goodbye to the Little Red Hen at the airport, and caught a bus back into town. We had decided not to load up our luggage with backpacking gear for the two-day hike, so we set out to “hire” backpacks, sleeping bags, rain gear and a cooking pot, all of which was supposedly readily available in downtown Queenstown. We pieced together our kit out of the motley assortment of supplies at Small Planet, where the guy helping us was slightly unsettled by how unequipped we seemed for the journey ahead. Apparently, most people showed up with their own stuff. Next, we were off to the grocery store to stock up on water, snacks and a dehydrated meal for dinner at the hut. We were only going to be out on the trail for 36 hours but we would be working up an appetite. We grabbed dinner at a decent Thai spot, called @ Thai, across town and spent the rest of the evening organizing our packs, before hitting Fergburger at midnight for one last meal before the journey. Leaving our luggage at the hotel in the morning, we headed to the pickup spot for our Tracknet bus to the Routeburn Shelter, where the trail began. The early morning ride along Lake Wakapitu was stunning and I was thankful that we stopped briefly in the village of Glenorchy at the northern end of the lake, since this was where one of my favorite mini-series, Top of the Lake, was filmed. Arriving at the trailhead a little after 10 am, we got situated with our gear and were off. That day we hiked the 12.4 mile route from the shelter to Routeburn Flats Hut, to Routeburn Falls Hut, finally arriving at Lake Mackenzie Hut a little before 7 pm. Stopping along the way for a snack at the Harris Saddle Shelter, we stashed our bags for a quick side trip up Conical Hill, a steep climb above the clouds, then continued our trek overlooking the Hollyford Valley. The trail was well maintained throughout but in this section, one false step could send you tumbling down the mountain. After reaching the hut that evening we had just enough time before the lights went out to set up our sleeping bags, make our dinner, and listen to the ranger talk about his project to bring the native songbirds back to the area by trapping the non-native stoats that were eating them. By 9:30 pm we had climbed into our bunk in the room with 30 of our fellow hikers, one of whom had a mighty snore that kept us up most of the night. The following morning, we were among the last to head back out on the trail, knowing we had plenty of time to hike the remaining 7.4 miles to Howden Hut and on to the Divide Shelter, where we were scheduled to catch the 2:45pm Tracknet bus for the 1 hour trip to Milford Sound. Again we opted for side trips, first to the split rock near Lake Mackenzie Hut, an enormous bolder with just enough space to shimmy through, and later to Key Summit, where we caught a view of Lake Marian, high in the Darran Mountains. In total, we hiked 23.5 miles for more than 13 hours with over 6,650 feet of elevation gain. 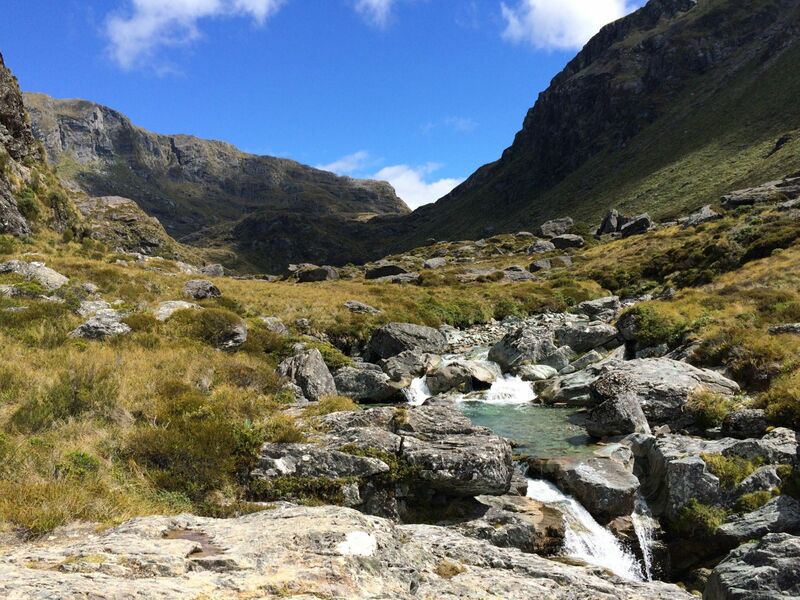 A note here that I have merely offered a glimpse of what it was like to hike the Routeburn. An attempt to truly capture it would require writing a post of its own. It was an unforgettable journey, packed with a diverse range of the most spectacular scenery I have ever seen in my life, comparable only to the National Parks of the Western U.S. From mossy forests to sunlit meadows to crystal blue rivers to dramatic waterfalls to mountain lakes to lush valleys to rugged peaks, all cast in the richest colors imaginable, it’s an experience that left us in awe of the magical forces of nature. At the same time, we also took great joy in hot food and a hot shower when we arrived at Milford Sound Lodge later that afternoon. I had booked us in one of the pricier riverside chalet rooms, knowing that we’d appreciate a good rest after our night in the hut. In fact, I opted for a nap, nodding off while gazing out the floor to ceiling windows at the tranquil Cleddau River. Later that evening we walked to town and dug into some solid pub fare (lasagna, bangers and mash) at the only restaurant in Milford, Blue Duck Cafe, while Eric got a lesson in cricket from some Aussies we’d met on the Routeburn earlier that day. Hundreds of waterfalls stream down into Milford Sound after a heavy rain. It poured all night and was still coming down hard when our alarm went off at 7am. The calm river outside our window had transformed into whitewater rapids. I wasn’t sure if our kayaking tour of Milford Sound would still be a go — and wasn’t thrilled about getting up so early in that weather — but we made our way to the lobby of the lodge anyway to meet our guide from Rosco’s Milford Kayaks. She told us that with the amount of rain they get in Milford, if they canceled due to weather, they would go out of business. We drove out to where the fishing boats were docked — apparently Milford does a booming business exporting crawfish to China — and got kitted up in an inflatable shelter filled with gear. 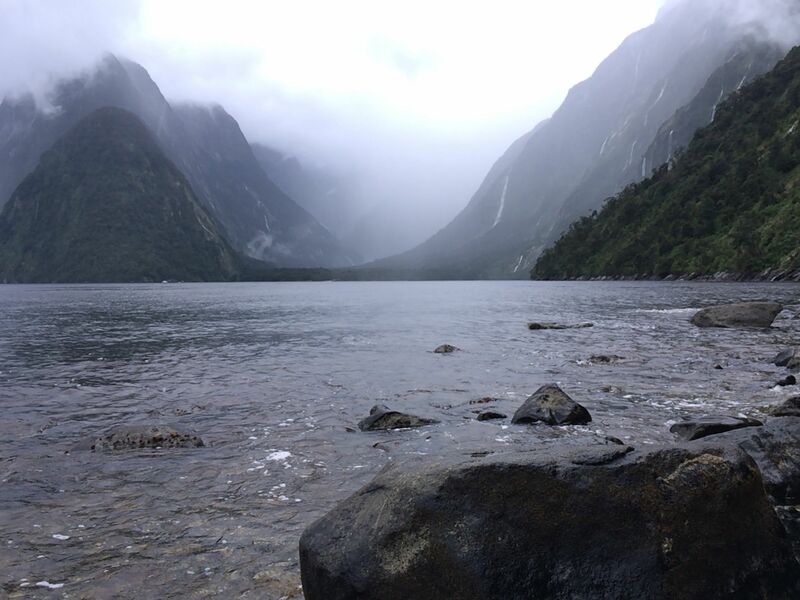 Donning thermals, rain and life jackets, and kayak skirts, we went over some kayaking basics and hopped in the water taxi for the trip into the misty fiord (it turns out Milford is not actually a sound but an inlet of the Tasman Sea). There were hundreds of waterfalls streaming down from the cliffs above, resulting from the overnight downpour. Since there was no shoreline, we were deposited directly into our kayaks. We spent the next four hours cruising along the mostly placid water, checking out the seals and waterfalls and paddling into the spray of massive Stirling Falls. We even spied a Fiordland penguin hanging out at the top of a small waterfall. Our seats were soggy but the rain wasn’t too bad once you embraced it and we weren’t cold at all thanks to the neoprene gloves attached to the paddles. Plus, we were working against the current, which helped us stay warm. We paddled into town with just enough time to swing back to the lodge, grab our stuff and catch the 2:30pm Tracknet bus back to Queenstown via Te Anau. It was another scenic route, and our driver delivered interesting facts along the way with dry humor, but I had trouble keeping my eyes open during the 5-hour trip. Back in Queenstown, we fetched our luggage, returned our backpacking supplies, and hiked up the hill to the nearby Hotel St. Moritz. We showered and walked into town for dinner at the lively Public Kitchen restaurant on the wharf. The food hit the spot (truffled chickpea fries, roasted vegetable casserole in filo dough, barbecue spare ribs). The shore of Lake Wakatipu in Queenstown. After packing our bags for the last time, we walked into town to enjoy our final hours in New Zealand. Over a leisurely brunch at Halo, we reflected on the trip, then picked up a few souvenirs. 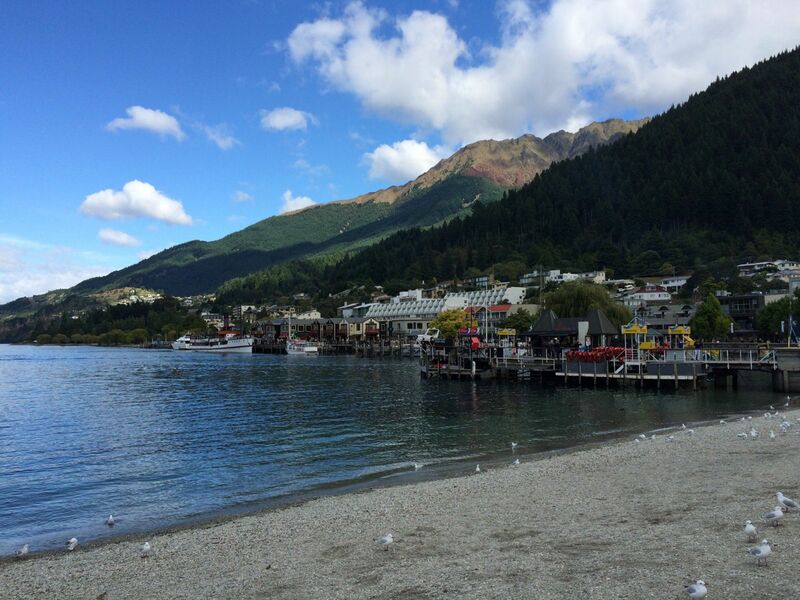 We could have used another full day to explore Queenstown, or even take one of the many adventure trips on offer. However, it would have been hard to top the Routeburn Track and Milford Sound, and it felt good to depart on a high note. After a quick flight back to Auckland, we were on our way home, grateful to have the time and means to take such a trip, and to the friends whose suggestions helped shape it. I’m happy I can now pay it forward. This article originally appeared on Medium and is republished here with permission.